We've showcased pets no one wants a few times, but this painfully honest hamster ad seems especially timely with the explosive popularity of Zhu Zhu pets, which I understand to be some kind of robotic hamster. This year's Furbee. Besides, I heard today that Zhu Zhu pets may be contaminated with antimony. Why poison your children when you can buy something that can a) bite them and b) die? 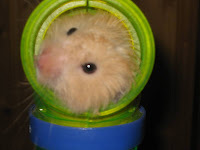 I have a male teddy bear hamster who is under a year old who I need to place in a new home. He is very cute and has lots of fur. Comes with a cage, and a few accessories. I have to find a new home for this little guy as he bit my son, and it ended up being a pretty bad wound. I have tried to keep him around hoping to still give him a good home, but my son is afraid of him (and I am a bit as well) and he's just not getting the proper attention. I do hope I can place him in a home without small children. Maybe with someone who has experience with "biters" and has some patience (and tough skin) for this little guy. He really is sweet if you can get past the whole trying to bite your finger off thing. Thanks to Nikki (the advertiser!) via Twitter.